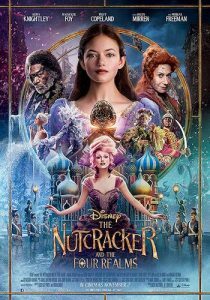 For a different twist to the annual treat of Clara and the tale of The Nutcracker, Disney’s The Nutcracker and the Four Realms takes viewers on a unique adventure to a magical kingdom. There is still the wonderful music we all know and love from Tchaikovsky, but not the ballet we have experienced throughout our lives. It has been replaced with an intriguing story of fantasy and love. Mackenzie Foy stars as Clara, whose mother Marie (Anna Madeley) recently passed away. Clara and her sister, brother, and father are experiencing their first Christmas without Marie. Clara is a genius at mechanical items, like her mother was. This is the key to her experience in the new world she is about to discover. With a nudge from her godfather Drosselmeyer (Morgan Freeman), Clara uncovers an amazing kingdom where her mother once ruled and now it is up to her to save it from evil. There are four realms in the kingdom (or Queendom) with Mother Ginger (Helen Mirren) and Sugar Plum (Keira Knightley) being the two dominant leaders. Clara must find a way to stop the destruction of the beautiful land once ruled by her mother. Can she live up to the high standards set by Marie? While the story includes many of the elements and characters of the ballet, don’t think this is the ballet set to a fantasy story. There is some beautiful dancing by Misty Copeland, and definitely stay for the ending credits as there is more dancing as the film ends. But on the whole, this is a whimsical story which engaged and entertained all ages in my screening audience. The very young kids were delighted and the older viewers enjoyed it as well. The story has shades of The Lion, the Witch, and the Wardrobe with a hint of The Wizard of Oz. That should give you a hint of the fantasy that will delight audiences this holiday season. Explore the parallel world of the Land of Snowflakes, the Land of Flowers, the Land of Sweets, and the Fourth Realm (with mice) with Clara as she confronts evil. Disney’s The Nutcracker and the Four Realms is rated PG for some mild peril.